You might have noticed something today if you logged into N26 for the web. Namely, it’s completely new! We spent a few months taking your feedback into account to make sure we included heavily requested features to give you more control over you account, regardless of the device. If you’re a natural doer of things, you’re most likely already playing around with it, but we thought it’d be useful if we gave you a highlight of its new features to help you out. To begin, the N26 web app is equipped with the complete functionality of your N26 checking/current account. We’re glad it’s now fully available on the web; so now you have access to the same great features you already use, but on a bigger screen. Send money, get paid, and manage your finances. The more you use N26, the more you’ll need flexible tools to do your taxes or keep track of your financial records. So we made it easier to download whatever you need. Just click the download icon in the upper right corner. You have three options here: the first lets you quickly download your account information. That’s handy if you’re ever at a trade fair or somewhere where you need to bill several clients. Just cut them in half and start handing out. On top of that, you can download your account statements. We’ve automatically organized them on a monthly basis, making it easy to print out and file. If you enjoy working in Excel, you can also download your activity in CSV format. 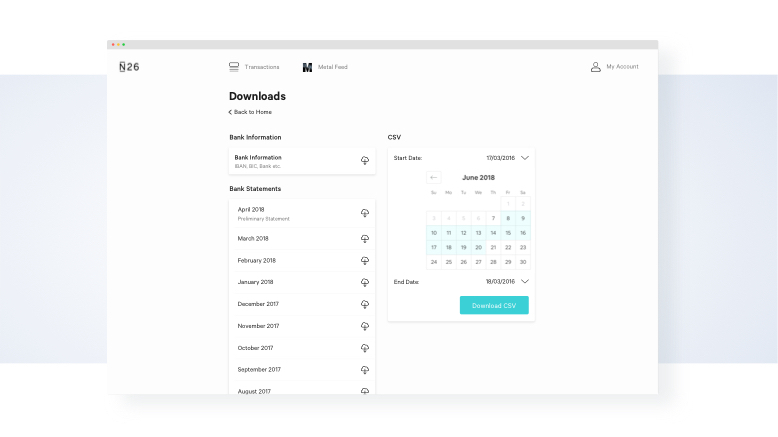 Just define the date range you need for your account activity and hit download. You can start working with them right away, saving you time when you do your taxes. We’ve organized most of the settings away from your transaction list. That lets you more easily scroll through your account activity; less eye noise helps. The new design matches our mobile app, giving you the same experience and removing confusion when switching between platforms. Speaking of cross-platform functionality, we made sure the new web app scales to all your devices—whether it's your desktop, mobile web on your phone or tablet, or your smart fridge. You should always have the best N26 experience regardless of device. One of our goals with the web app was to make it more accessible to anyone, including people who are visually impaired or might suffer motion sickness. So we added three completely new features in the App Settings section under your Account Settings. The first is dark mode. It’s easier on the eyes at night and give you another great way to use the web app. Second, we have introduced something called discretion mode. Need a little more privacy when browsing your transactions? Just toggle it on and it blurs out your balance and the monetary value of your transactions. It’s perfect for when you want to check some transactions at work but don’t want your neighbor seeing your balance, account details, or how much you’re spending. Finally, we introduced something called reduced motion mode, which disables animations, transitions and GIFs across the web app for people suffering from vestibular disorder or motion sickness and those who just want a simpler experience. Featured in the My Account section is all the information you’ll ever need for your account, including your card ID, IBAN, BIC, and membership benefits. Both Black and Metal customers have added sections for their membership benefits—including their policy information and instructions on how to make claims. Metal members also have a separate section for priority customer support. If you are a basic user, you can now comfortably upgrade from your desktop. The My Account section also houses some of our most powerful and useful features. If you lose your card or phone, you can instantly lock your card or unpair your phone. If you still can’t find your card, you can order a new one. Need it quicker? Just get it express delivered. 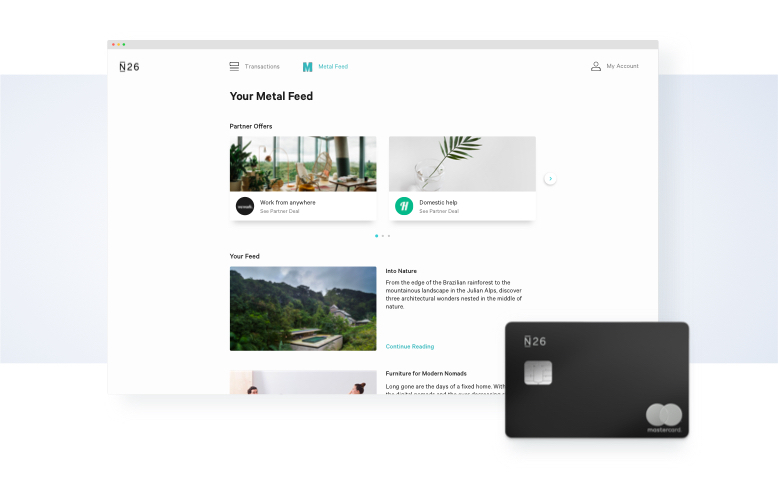 Finally, the N26 web app is optimized to work across web browsers and operating systems, giving you the smoothest experience possible. It’s supported on Chrome, Safari, Firefox, Edge, Brave, and many more browsers.